Haute Couture Drapery is the custom Toronto drapery experts and we offer classy and sophisticated custom drapery for your home in Toronto, Mississauga, Newmarket, Scarborough, Oakville and Greater Toronto Area. Our showroom is located in Vaughan, GTA and our goal is to provide you with superior service and affordable prices on custom made drapery. 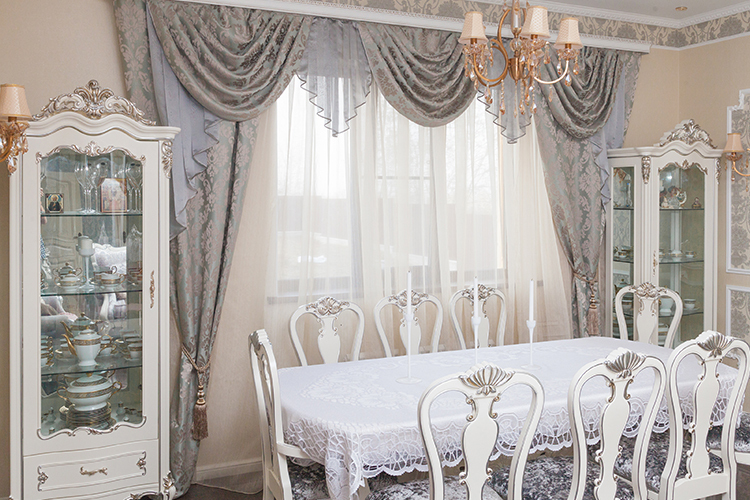 With over 30 years of experiences and over thousands of choices of fabrics and custom drapery styles, Haute Couture Drapery has been helping transform homes in the Greater Toronto Area with custom drapery that is both elegant and functional. Our services include custom drapery with a variety of different customization options to help you achieve that unique look you are after. We will work with you to create custom drapery to complement the unique design of your home; be it traditional, contemporary or modern. Our interior designers will help you decide the perfect color, fabrics, and drapery styles which will also open your mind to various custom drapery options that suits your persona, style and taste. We believe that every window treatment should be unique so every project handled by us is completed with special care and top quality control to give you a beautiful and long lasting drapery solution for your home. We provide professional advice so you know your options with 100% satisfaction guarantee. Visit our Showroom in Improve Canada Mall in Vaughan or contact us with no obligation for an estimate in Toronto GTA area.